I've been using Google Documents for couple years already, I've even do not have office installed on my laptop at all. Now IBM did something similar? I've tried it already and should notice that Live Symphony is still far-far from Google. First what I've found - no support of right click mouse, only action bar. From another side, I'm happy that IBM tried to do that. Test link. That's nice. I've installed FP1 (for 8.5.2) without any problems. 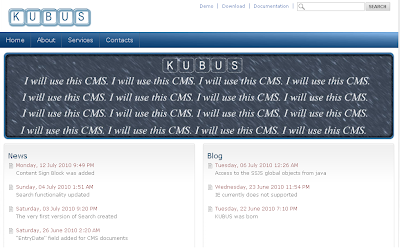 We (means me and my fellow :)) started to do free CMS based on xPage in our free time. The main aim for us is to get more experience in xPage's area. When we finish we will upload it to openntf, I hope first version will be available soon. It would be nice to hear any responses. I already installed FP3 ! FP3 for Notes/Domino 8.5.1 is available from today! I already installed it :) and what about you? New version of Skytus 0.2.0 is available for download ! The major changes are installation and unistallation. Now this is MSI installation (before it was NSF, and I have to say I do not liked it). Now it will be more native for user to install and uninstall Skytus. There are also some changes/updates for functionality. I've already installed 8.5.1 FP2, what about you :) ? We made new version of Skytus 0.1.15. it is available for download now ! What do we have in new version? - fixed issues we found in last build (0.1.14). - added some more stability to LN when it does not have Skype installed on it. - we made many tests with this add-on so it should be much more stable. So if you still did not try our tools, do it now: Skytus ! We will be happy for any comments/suggestions! I spend a lot of time for this. Now I found the good place for downloading Lotus Notes. Probably it will save a lot of time for many people which looking for them in Internet. But I don't know, is it legal to share them? because if no, I will remove the link. The announcement I've been waiting months to talk about! I found 2 sites which store many lotus notes's blogs. I'll look at them more closely later, but in any case I like it and recommend to lotus notes developers to save the links. One of them is DominoBlogs.com - I suppose the oldest and another one is Planet Lotus.